Pineapple mill juice (or pineapple syrup) is the liquid extracted from pineapple cannery wastes such as the skins, core, crowns, ends, trimmings and fruits too small for slicing. Once extracted, the mill juice is concentrated by centrifugation. Pineapple mill juice has approximately the same composition as pineapple juice, but contains less soluble solids and is more acid than pineapple juice. It may also contain some undesirable flavour materials and heat-darkening agents due to the Maillard reaction. Once the off-flavour and off-colour factors have been removed, pineapple mill juice can be used as a sweetener and a source of fructose. Juice from other off-grade sources (e.g. rotten and damaged fruit) may be added to mill juice, concentrated and then added to wet pineapple bran to increase bran yield, or may be used as a source of sugar in the production of alcohol and vinegar (Hepton et al., 2003). See Pineapple cannery by-products datasheet. Raw pineapple mill juice contains 11% soluble solids, of which 75-80% are sugars, 7-9% citric acid, 2% malic acid and 2.5-4% protein (Ben-Gera et al., 1969). In 2011, research on the use of pineapple wastes for pigs was still limited to trials carried out in the 1930-1940s in Hawaii. Concentrated pineapple mill juice (pineapple syrup) was often used in Hawaii to feed pigs, possibly until the 1960s, when both pineapple and pork productions were important in this state of the USA. 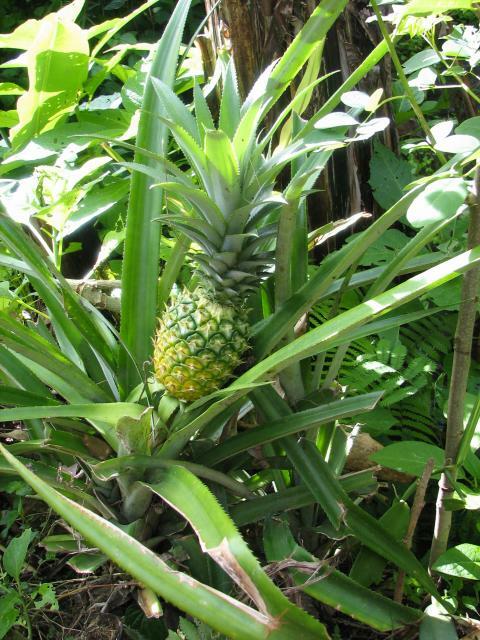 Pineapple wastes were used more or less in the same way as cane molasses but were found to have a slightly superior feeding value due to their lower ash content. Pineapple syrup replaced up to 40-50% of the barley in diets for older pigs. A diet consisting of 80% syrup and 20% protein supplements gave satisfactory gains in 55 kg pigs, but it was recommended to start the pigs on a regular ration and change them to the pineapple syrup ration once they reached 45-55 kg (Henke, 1949).